Another enhancement for the next release – an admin settings page. 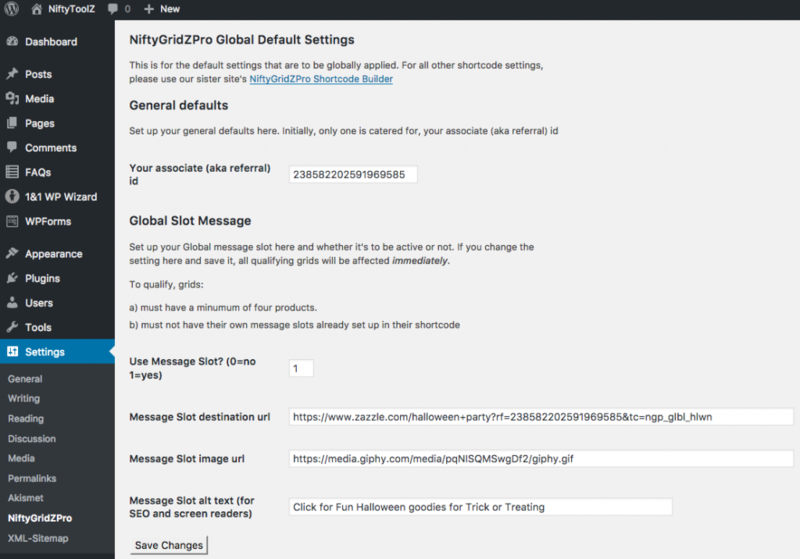 This is for global defaults – those that apply to every grid that doesn’t override them with options set in their shortcode. You can now set your associate/referral id here. Once set here, you no longer need to put yours into each post’s shortcode. Though saying that, the shortcode builder still needs it and must include it in its generated code (for backwards comaptibility reasons). Best of all, this new settings screen let’s you set your global slot message in real time! So basically, it broadcasts your new marketing message in real time right across your site. It’s so easy to do, you might have one in the morning, a different one in the afternoon and one for the evening!